Mae is responsible for producing detailed 3D modelling and drawings for steel fabricators and erectors. She applies these skills to certain projects of Modern Construction. Giving deeper understanding of columns, beams, bracing, trusses and more for use in the construction of various types of infrastructure. Mae is also a Coping Machine Applications Programmer. This see’s her prepare and edit NC files to create nesting files for the copying machine. Working closely with key stakeholders such as architects, engineers, contractors and fabricators she helps to provide them with her company’s technical and manufacturing expertise to deliver their projects. Modern Construction is based in Hamilton and is well known for their custom manufacturing products and design and construction services that have evolved since its inception in 1960. Senior Structural Steel Detailer and Coping Machine Applications Programmer, May Rose Billanes on the Modern Construction workshop floor. Find out how people reacted to Mae’s choice of career below! Mae, tell us about what led you to become a Structural Steel Detailer & Coping Machine Applications programmer. Originally from the Philippines, I graduated with a B.S in Architecture. At first my family was a little reluctant towards this career path because they perceived it as a male field. An offer to work within a structural detailing company changed all of that. Not only in allowing me to gain exposure to a role totally different to my education, but for my parents to see my passion for the construction industry. While my intentions to take this job were to improve my knowledge of AutoCAD software for architecture – it turns out I fell in love with structural detailing instead! Since then, I’ve never looked back. Especially since I met my husband at university and we both started working as Structural Steel Detailers together. As well as gaining the support of my family and friends for a career that makes me truly happy. Structural steel detailing is a critical process of structural engineering and demands near 100% accuracy. Even a tiny error can lead to a loss of valuable time and money. To me, the process of steel detailing is a vital ‘communications link’ that connects key professionals such as engineers, architects, contractors, fabricators and others. All of whom are individually and collectively responsible for the highest levels of accuracy at each stage. I love this challenge that every project I handle brings. It enhances my knowledge and makes be better at doing my job constantly. That has to have been working on the Parkhaven project. A 186 tonne steel multi-storey office and apartment building. It had 350CHS columns with four x-welded stub diaphragms on each level which created a “Christmas tree” effect for its assembly. Being involved from the tender process through to detailing and fabrication was a rewarding experience for me. It allowed me to apply my skills and comprehension of architectural and structural drawings, my strong attention to detail and drive for accuracy. It also made me more fascinated in my job and has driven me to want to learn more! What barriers do you think exist stopping other women from following a career path like yours? 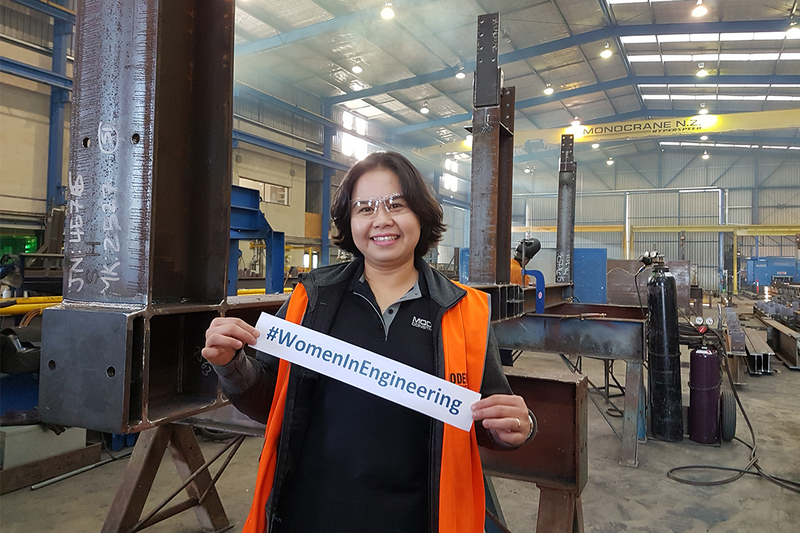 I believe every woman is capable to excel in the engineering industry. But, I think negative stereotypes around a female’s abilities in mathematics and science persist. This is despite the considerable gains in participation and performance in these areas during the last few decades! Scientific work is better suited to men. We need to break these stereotypes. I strongly believe that math and science aren’t difficult subjects at all. To me, if you enjoy and have a natural propensity toward STEM, this should be the deciding factor of whether this career is for you or not. That’s why even as early as primary, these subjects must be given emphasis in teaching to empower all children – regardless of gender.